Monick Halm is a real estate investor, syndicator, and developer with over 13 years of real estate investing experience in multi-family, mobile home parks, RV parks, flipping, vacation rentals, syndication, and ground-up development. Together with her husband and her investors, she owns over 1000 rental units across 5 states. She is the founder of the Real Estate Investor Goddesses online education, mentorship, and community for women real estate investors, #1 bestselling author of The Real Estate Investor Goddess Handbook and Wealth for Women: Conversations with the Team That Creates the Dream, and the host of the Real Estate Investor Goddesses Podcast. She is also a Real Estate Strategy Mentor, keynote speaker, recovered attorney, avid world traveler, wife and mother of three amazing kids. 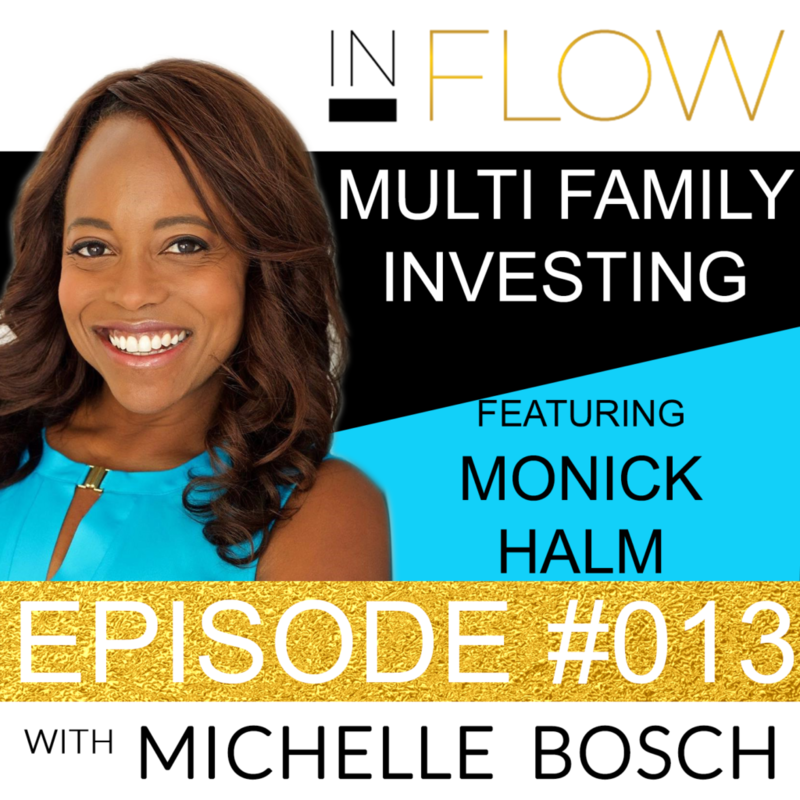 In this episode, Michelle Bosch chats to Monick Halm about Multi Family investing, and the lessons she has learned in her career. Monick Halm has made it her mission to help 1 million women create financial freedom through real estate investing. You can connect with her at www.reigoddesses.com. 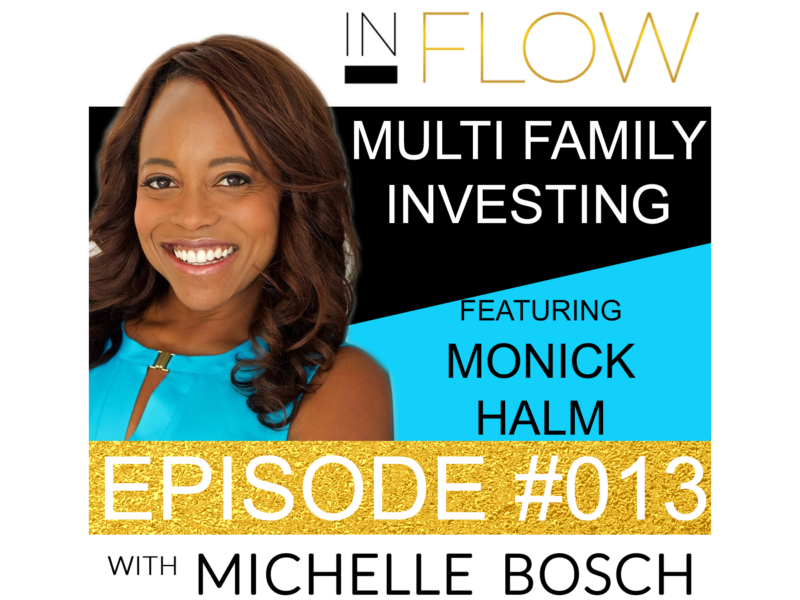 Michelle: Welcome to the InFlow Podcast. I am your host, Michelle Bosch. I see a gaping hole across society that focuses on the outer work and forgets about the inner work when what we really need is to bridge the gap between prosperity and spirituality to live a life in flow with inflows of light, inflows of cash, inflows of creativity, inflows of grace in our lives. Each week join me for powerful messages and interviews that will leave you inspired and ready to step into flow in your higher work. So now, let’s go. Welcome to the InFlow Podcast. I’m your host, Michelle Bosch. I have been looking forward to today’s episode. I’m very excited. I have the privilege of having an amazing real estate investor with me today. Just recently she gave me the opportunity to collaborate on an Amazon best-selling book, “Wealth for Women” with another 17 of the nation’s top women real estate professionals. And that book actually launched in November and was an instant success and I’m just thrilled to have her here today. And my guest today is the amazing Monick Halm. Monick is a real estate investor, syndicator, and developer with over 13 years of real estate investing experience and she’s done a little bit of everything, multi-family, mobile home parks, RV parks, flipping, vacation rentals, syndication, ground-up development. I mean, she is like the queen of real estate. Together with her husband and her investor she owns over 1,000 rentals across five states. That is impressive. She is the founder also of the Real Estate Investor Goddesses, online education, mentorship and community for women real estate investors. She is the author of the best-selling book, “The Real Estate Investor Goddess Handbook” and “Wealth for Women: Conversations with the Team That Creates the Dream” which is the one that I was invited by her to collaborate with, like I said, 17 other amazing fantastic ladies. She is also the host, and that’s kind of how I met her originally, of “The Real Estate Investor Goddesses Podcast.” So she hosts her own podcast. You have to definitely tune in and check it out. She’s also a real estate strategy mentor, keynote speaker, a recovered attorney, avid world traveler. I know she was just in Australia. I saw her petting koalas just like two days ago. Wife and mother of three amazing kids. And I am so, so inspired by her mission to help a million women create financial freedom through real estate investing. So without any further ado, welcome to the show, Monick. It is exciting to have you here at the InFlow Podcast. How are you? Monick: Thanks so much for having me. I’m doing great. I’m excited to be here. Michelle: Thank you very much for making the time. I was just talking to Monick, I’m like, “Are you still jet lagged?” I hope you’re okay. You’ve recovered from your trip because it’s like an 18-plus hour time difference, but I’m glad to have you here. So I wanna jump right in, Monick, and I want us to start with, how did you get into real estate investing? I know that you’re an attorney by profession and that’s kinda like how your career started, but how did you transition into real estate? Tell us a little bit about that. Monick: Sure. I got into real estate completely by accident. I knew nothing about real estate. Growing up, I have wonderful parents, very loving family. They’re from Haiti and I’m a first-generation American. And what they always taught me about being successful and basically what I learned about money was to be successful, you’re going to go to school, get the most education you can and you’re gonna become a doctor, lawyer, professor, engineer. Basically, that was what success was. And I was a dutiful child and student, so I went off and I chose law out of those possibilities and I became a lawyer. I was miserable as a lawyer, but that’s a whole other story. So I was working and the only thing I’d ever been taught about real estate is that eventually, you wanna get your own home, you wanna own your home. So I’d been working for a few years and I thought, “Okay. I guess I should buy my house now.” And this was Los Angeles in 2005 and that was towards the top of the last bubble. And even making six figures, I had a hard time finding a house that I could afford by myself because the houses were easily upwards of $600,000 and $700,000 for a house. Monick: Yeah. Like, a small house in a somewhat decent neighborhood. Not even like a nice neighborhood, just like not a dangerous neighborhood. So a friend of mine was in a similar position. He was a consultant. He said, “Why don’t we buy duplex together? You live on one side and I’ll live on the other side.” And I thought, “Well, I could probably buy half a house, so yeah, let’s do that.” So we went to find a multi-family and ended up falling in love with this one property that had a duplex and then it was a converted garage in the back and the one side was much nicer than the other, so we ended up each taking a bedroom in the bigger side renting out the other one, renting out the converted garage. We even rented out our basement to a friend. And I started house-hacking before I knew that was a thing, like, I just realized like, “Wait a minute. These people are paying our mortgage. This is awesome.” I was just trying to get a house. Like, the fact that I could live in some place for free basically hadn’t occurred to me. And then when I met my husband, he had a duplex and then over time we got another rental and we started flipping houses and eventually we got into the syndication. But I was totally an accidental investor. Michelle: What area of law were you practicing? Monick: I was a corporate litigator. Michelle: Oh my goodness. You were fighting. No, I’m kidding. Monick: Yeah. I was. I didn’t like it. I’m a lover, not a fighter. I’ll be honest. Michelle: Now, as far as growing up around money and finances and being a first generation… You already gave us a little glimpse, but what did you think or what was something that was told to you about what money is and what it’s supposed to be and do for you and so on and so forth? How did you grow up? What was the philosophy behind there? Monick: Yeah. So I don’t think my parents really were very thoughtful about money. I mean, the lessons I got about money were, one, get a job and get the highest paying job you can, but basically, I was always taught you trade your time for money. That was the lesson. The other lesson I got from my parents because paying bills time was always a very stressful time in the house. I got the message that money is stressful and don’t deal with it too much. So I was… For a long time, I didn’t wanna deal with my money, so I would… I was making a good income but bills would come in and I’d just sort of throw them in the corner, and then like, when the next bill came with like, a little sign saying “Overdue,” we were like, little red. So I’ll go, “Oh shoot. I guess I should pay that.” I was just like, not…. completely just horrible with money. Yeah. I was an over-spender. I would make a lot of money and I would spend everything that I made. I was a mess. I lived in complete financial chaos. And it was only when I was starting to get…I got engaged with my husband and he had two kids, I was going to have step-kids and I was getting married and I knew that financial issues is one of the biggest causes of divorce. I don’t wanna bring my financial chaos into this marriage, so I needed to get straight around money. I needed to get a handle on this thing because it’s like, I can’t go into… It’s like, one thing for me to live with that chaos, I couldn’t make my poor husband and his two kids have to deal with it too. So I did a lot of study and learning and work around money and abundance and mindset to really shift. Michelle: Yeah. I think all of us in one way or another have either had some kind of an experience either growing up where our parents were doing the best they could but planted seeds of money not necessarily being something that could be good, that you should manage especially as a lady. I’m also first generation immigrant. And yeah, it wasn’t necessarily much talk about it for sure unless it was something stressful and we needed to pay for something or something like that. Yeah, absolutely. Monick: Yeah. No, there was never any of that and never any talk of investing. Michelle: Yeah, absolutely. Yeah, absolutely. Yeah. Now, right now, what is your… What asset class are you focusing? Where are you investing right now? Monick: So we have some different asset classes. One of the asset classes we’re excited about is industrial actually right now. We like industrial because it’s… I like the triple net leases. I also like that with industrial….with all of the new online sales, think for every million dollars of online sales it equals another thousand feet of industrial because people, they need places to store all of the goods and they still… Even with online sales, there is still stuff that needs homes and all sorts of businesses need industrial and it’s an area that’s not too over-run at the moment. Michelle: So it’s not very crowded. I mean, it’s basically kind of like warehousing. Yeah? Michelle: Now, just to get an idea, like, what dollar amount, acquisition amounts are we looking at when you say business parks? Monick: This was a $24 million deal. Michelle: Wow. That’s fantastic. Congrats. Now, what I’m thinking is that this is probably getting done in the form of syndication. Michelle: Okay. Tell us a little bit for a person or a lady that is listening to us that has never heard that word syndication. What does real estate syndication mean? Monick: Yeah. I hadn’t heard of it until about three years ago. So basically, a form of crowd-funded real estate. So it’s bringing groups of investors together to purchase a larger property, a property that’s larger than generally what most people could get by themselves. Monick: So the syndicator or sponsorship team, they find the property, they do the financing, they bring the investors together, they bring the money together. Normally, there’s some investors that might help pay for the down payment and some of…. any of the rehab costs and then they also get a loan. And then the syndicators just manage the property. They’re not necessarily property managers, but they manage the asset. And then the passive investors they just put in their money and wait for it to come back with funds. Michelle: Now, I know that one of your fortes is fundraising, and every single time I either get online or go to several events, mastermind events with other multi-family syndicators, their biggest problems are usually two. Number one is, they either don’t have enough deal flow or number two, they have problems actually raising funds to close on projects or acquisitions that they have going. So on the fundraising side, what do you attribute your success to? How can you say, “Okay. Very confidently I’m gonna get 24 million worth of real estate under contract.” Tell us a little bit about fundraising and what are you doing different. Michelle: Okay. It sounds good. Monick: …that I think works. First, I start… I’m very much of a people first. I have a people-first philosophy when it comes to real estate. So it’s people first in terms of the team, it’s people first in terms of the investor. So I find investors, and I make sure that I take time to really find out what they’re interested in, what they’re looking for, what their goals are, and then I find deals that match the investors versus having an investment and then scrambling to find investors to match my deal. I go investors first and then I find things that are fit for them and their needs. So that’s a big thing that I do. I also have very much of a relationship for life philosophy. I really look to be able to have a lifetime relationship with people so that they can… And I come with that heart, I think people feel that, that it’s not about being transactional, it’s really about like, “How can I make this work so well for you that you wanna do another deal with… you wanna partner again and again and again and again?” And that’s with everybody that I’m working with I have that philosophy. Michelle: You’re being really transformational to their family because now it’s a legacy that they’re building for their kids and eventually, who knows? Your kids may be working with their kids. Michelle: Now, on the deal flow, what do you do on a deal flow to make sure that you have either a steady inflow of good deals especially right now when it’s a time to be acquiring very carefully? How are you going about doing that? Monick: Again. It’s people first. So for the most part right now, when we first started we were doing more of the operations and getting the team and doing everything ourselves. Now, I’ve realized that my real forte is in the fundraisings and not just my forte, but it’s what I most love to do. It’s the fundraising and then the team building and being around people, investor relations. So I just created relationships with other operators that are excellent at what they do. So the people that… With the industrial, it’s an opportunity that friends of ours that we’ve known for maybe about five years now, they are the ones that found this opportunity. They’ve done…. this is probably their ninth industrial project, so they have a great track record. They’re excellent at what they do. And so I find people that are really excellent at what they do and could use some more investor money and I partner with them. Michelle: Sounds like the kind of way you wanna do business, anyways. Absolutely. Now, I know that I mentioned earlier that you have acquired and you’re managing about 1,000 doors right now and you just mentioned team building. So on the team building side, what is your superpower? What do you wish you would have known when you started that you know now in terms of team building? And who constitutes the team for example in a project like the one that you’re taking down right now? Michelle: Yeah, let’s start there. Monick: So one of the things that I wish I’d known at the beginning that I’ve learned is that you work with the best, they don’t cost you money, they’ll save, they will make you money. And trying to go with the cheapest is not necessarily the best way to go. So I’ve learned that the hard way. And often when you’re investing and you’re thinking, “Oh, it’s like a cost-benefit analysis. Well, gee, if I go with this contractor that is this much cheaper than that guy, then look, I’m gonna be making that much more money,” not really necessarily factoring the fact that the cheaper guy may not know what he’s doing. And that’s definitely happened to me. We were like, “Okay, let’s go with this guy. We’re gonna go with this cheaper person and he’s gonna save us money,” but he did not know what he was doing. In the end…. it took us way more time, we spent a lot of money then we had to go and hire the more expensive guy who knew what he was doing after the fact to come and fix what the…. Michelle: … what the other guy screwed up. Monick: …cheap guy did. He did not end up saving us any money at all. And if we had just gone with the best person at the beginning then we would have saved time and money because he really…. he knew how to do what he was doing with short… He knew how to get the better deals and had connections. And he was more expensive up front, but he saved us money in the end. Michelle: Yeah. And it’s not coming from a bad intention. I think when we all start we make I think the same mistakes and it’s not from just wanting to go for the cheaper guy, it’s the intention behind it is usually you wanna be a good fiduciary of your investors’ money and therefore you’re trying to save the project money. Now, continuing on the team building side, what else are you guys doing to come in and bring a fantastic…. and assemble a fantastic group of people together? Like, who constitutes a team right now in a project like the one that you’re working on? Monick: Sure. Well, I’ll give you one of the best pieces of advice that I’ve gotten that really helped me build great teams and that was from this genius woman named Beth Clifford who’s done, I don’t know how many billions of dollars’ worth of development and real estate investing. But she taught me this thing about the three C’s in terms of bringing peace. So this is something that you look for, for everybody that you work with. And the first C, and this is the most important, it has to do with character. You look at somebody’s character, like, who are they? Because character cannot be taught, right? So searching for their character, their integrity, their honesty, whatever is important to you in terms of character. Character. Next is commitment. So do they have the same commitment to the mission, the project, your vision that you do? For us, it’s really important this… Well, character but also commitment. We have a commitment to leave a community and a property better than we found it. And so we need people that can share that commitment. It’s not about being slumlords or like, getting the last dollar. It’s really about like, we have that commitment so they need to share that commitment, but also it could be working with somebody that has the commitment to the project, so they’re not taking on five other things and not showing up when you need them to because they’re not committed to doing the work that you need them to do. The commitment. And the last C has to do with capacity. So that’s being able to do the work. Having that skill set, and that’s when it comes to working with the best, right? Having the capacity for what you actually need them to do. So, all of those are what I look for when I’m looking at a team. And then with regards to this team, this industrial project, on the sponsorship side, we have those that are on operations, we have a great property manager, we have a great maintenance team as part of the property management company. There’s our bookkeepers, and CPAs, and attorneys, and we work with self-directed provident funds providers. I mean there’s a variety of different team members that we have on this deal, and, of course, our investors. Michelle: And I love… I took notes, actually, on the three C’s. We on the land side when we teach in our seminars we also talk about four C’s, and our four C’s are basically to build confidence where like, okay, in order to build confidence you need first commitment, then you need to master courage because you’re gonna go through periods of uncertainty when… What the heck you’re doing, but you go ahead and do it anyways and you gain capability which is a third C, and then that builds confidence to go and do bigger and bigger projects. So I love… I’m a fan of the C’s. Michelle: C’s are definitely awesome. Monick: I love your C’s of motivations, C’s of getting it done. Yeah. Michelle: Absolutely. Now, I’m gonna switch a little bit gears now and I wanted to ask you a little bit about how do you incorporate faith and spirituality into your life to get in flow to go out there and do the things that you know you’re here to do for women in the area of real estate and so on and so forth? Can you share a little bit of the things that you do? Monick: Sure. Well, my whole mission was downloaded to me. I mean, it came to me and I feel like it is definitely a mission from spirit, a mission from God to do the work that I do. So it guides everything that I do. I also every morning I meditate and I pray and I connect with that purpose but also asking for just clear guidance, right? It’s like, “Okay, you gave me this mission. What do you want me to do today?” And then also I have a lot of faith in surrender because sometimes I’m just in the middle, I don’t know what’s gonna happen and I sort of go, “Okay. Well, if you wanted me to do this, then just tell me what to do or you [inaudible 00:24:03] you just let me go.” But I’m always having conversations. And just really surrendering and relying on spirit or it’s God, the angels to guide me. Michelle: That is fantastic. Thank you so much for sharing. To wrap up, what would be three pieces of advice? Because you are now out there educating women and being a mentor for women. I know you had an event right now in November that coincided with an event that we had so I couldn’t be a part of it, but I know you’re doing events and you’re really part of your mission is to being this incredible advocate for women, for more women to gain financial independence through real estate. So what are some of the three things that you think women should know out there in terms of creating inflows of cash, inflows of ease, inflows of grace in their lives? Michelle: So whisper from God. Yeah. Monick: Yeah. And sometimes it’s a knock on the head. It’s not so quiet, but it runs you over like a Mack truck, but however, it shows up, like, listen to it. And then actually, if you listen to the whispers, then you won’t get run over by it. It’s when you start to… When you ignore the whispers after a while it gets harder until you can’t ignore it. At least that’s been my experience. And then the second piece of advice I would give is to practice the one thing. So the one thing is something I got from the book, “The ONE Thing” by Gary Keller, and he says, “Ask yourself, “What’s the one thing that will make everything else easier or unnecessary? What’s the one thing I can do that in so doing will make everything else easier or unnecessary?” So a lot of people especially women, we’re very busy. We’re very busy. “How are you?” “Oh, I’m so busy, busy, busy, busy, busy.” But not everyone. Most of us are not that productive. So being busy and being productive and actually effective are very different things. And that one thing question has been the most powerful tool that I have found to get productive, to get effective because if you do that one thing, then you will get very far. And it’s not about being busy and doing a lot of busy work and getting the whole checklist done, but if you do things that most move the needle then you can take a lot of…you can get really far and with more ease and grace because it’s gonna let go of the things that are…it will let you not do other things or make them easier. So the one thing. Monick: Yeah. Build team. Build a sales team actually in particular like having a sales team with people that can have more of these conversations for me, but it’s teams. Build teams. So it’s not so much on me. Michelle: Yeah, absolutely. Yeah. I’m sorry I interrupted. Continue. Monick: Yeah, but that was a good question. But yeah, for me, it’s team. The theme of this year is team, build team. Yeah. I started last year and I really had exponential growth with the building team and that’s… If I’m gonna help 1 million women I cannot do that alone. Michelle: Tell us a little bit more about that. What is the plan for this year, for the future? What are you envisioning? How can, like, people that are listening here tune in to that vision? Just tell us what’s in the pipeline? What’s exciting right now? What are you excited more? Monick: What’s exciting? Well, one of the…the thing that is exciting me the most right now is I’m putting together this goddess fund, this funding platform to help make it easier for women to invest in real estate and they’re investing in women-run real estate projects, so women investing in women, women building wealth together. And it’s that mission of helping 1 million women create financial freedom. And for me financial freedom is that you have enough passive income that you can keep your current standard of living without having to work, because I believe that when you have that, we as women when we have extra, we give back, we give back to our families, we give back to our communities, we give back to the world. And they found this in a lot of studies. They give women extra money in like, the microlending, they give women money, they start building these businesses, they send their kids to school, they… In a generation, the community is completely transformed for the better when they give money to women. Michelle: And it…and it starts young because I know Sophia, my daughter, lends out $100 at a time to ladies in third-world countries that need some support to get their little entrepreneurship project going. And you’re right. And we’re not saying that men are not generous, but I do agree with you in that women definitely, I don’t know, we’re much more inclined to recirculate that wealth. Monick: Yes. When they’ve done the same with men and they’ve done these microlending and they give it to focus on men, and this is another sad part about it, like, it’s just that they tend to spend it on alcohol, cigarettes, and prostitutes, which is… But if they can give it to… And I’m not saying that’s what all men do with extra money. I work- with my husband. I love men. Monick: I love men. No, it’s just… Yeah. But men tend to like the game of money, so like often it’s like, “How much can I make? I can make more and I can make…It’s like a game and it’s fun,” and they want to like they like to build it… They like money for the sake of money. Women are more inclined….This is a gross generalization. So don’t get mad at me everyone. But women are more inclined for money for how it can help others because once we get our needs met, we tend to think about, “Okay. So how can what we…how can we use our money to help others?” And it’s not that we wanna cap on our money and we don’t want wealth or anything like that. It’s just that we are more wired to give back. So my focus on helping women create financial freedom is because I know that if I help 1 million women, a million women are helping millions more. So that’s the way we’re going to change the world, and our world more than ever, needs help. So we need powerful women that are empowered to go out and do what they were born to do, what they were put on this planet for. Michelle: Now, I know you have a real estate soul mates event in July? Monick: I do, yes. I have… So this is for women who want to work with their partners. So this is gonna be happening in Belize. Michelle: Nice. I like the sound of that. Monick: Yeah, 20th and 21st. And it’s for couples who want to invest together and… Like, you and husband, you work together. Monick: So a lot of other couples want to know, it’s like, “How can I work with my husband or get him onboard or do it together?” And even husbands, like, “I’d love to get my wife onboard and have her be part of this.” So they can work together with your couple. Michelle: That’s a fantastic idea. Monick: Yeah, as a couple. Michelle: I don’t know of anyone else that is doing that, so that is a fantastic idea. Monick: Yeah. And then also how can you make your relationship juicier as a result of working together? How can you use this to take you guys higher as a couple? That’s what the retreat is about. Michelle: That’s beautiful. Yeah, working for a joint vision of a financial future together. Absolutely, I love that. Because we see that a lot especially sometimes at our events where either the wife or the husband and they come alone and they really wanna invest in themselves or really wanna go out there and go for it and just take inspired action and they come home and the other partner has absolutely no clue as to the experience that the other person has had during the three-day event, and they kinda like are either second-guessing or doubting and really it isn’t until that person shows them the money and goes through a deal and so on and so forth and shows a level of success that you start getting the other partner onboard but it would have been so much easier and so much ease and grace if they both would have been together on the same level. And so that’s fantastic. I love it. So if anyone listening to our show today wanted to connect with you, where would they do that? Monick: The best place is probably to go to reigoddesses.com, my website. And then you can find me, you can find out about our programs and events and our investor club if you’re interested in doing these passive investments and just connect also with our sisterhood. So we have this incredible online community of women from all over the world that are interested in real estate investing and you can get on there and join our sisterhood. It’s a pretty, pretty amazing group, super heart-centered, helpful, amazing group of women, so go on there and join the party. Join the sisterhood. Michelle: Yes, absolutely. Join her, also follow her on Facebook, Instagram. I follow her. That’s how I found out that she was petting koalas in Australia just a couple of days ago. Monick, you are an inspiration. I have like, a bunch of notes here because for me, I get to learn from bringing women like you that are way ahead, and so you have been an inspiration. Thank you so much for taking the time to be with us to share a little bit about your journey and what you’re doing and your mission. I really relate to that. I can feel your heart for sure in it. And so thank you very much for being with us here today. Monick: Thanks for having me. And thank you for the work you’re doing. Michelle: I hope this episode left you feeling inspired and ready to get inflows of cash, inflows of light, and inflows of faith in your life. I welcome your reviews on iTunes. Please leave me a review and help me create an amazing community of women in flow. Thank you as always for sharing your voice by going to michellebosch.com and joining the conversation about this show. And while you’re there, grab a copy of my “Ten Commandments to Living a Life InFlow.” You can also follow me on Facebook at Michelle Bosch and on Instagram at michelleboschofficial. Thank you very much, and until the next one.